ELVIS DECODED: The 2:47pm Exit? In the photo on the left, we see an ambulance facing west, either driving out of the Graceland gate, or parked just east of the guard house. This photo was purportedly taken by Martin Davis when he stopped by Graceland on his way to a work site, and he stated to co-workers as they viewed the Polaroid snap-shot that the ambulance was departing Graceland en route to Baptist Memorial Hospital on August 16, 1977. This would place the time of this photo at 2:47pm. Mr. Davis said that he parked across the street from Graceland, then got out of his car and crossed the street so that he was standing at the gate. After awhile, the ambulance that was parked at the front of the mansion came down the hill, and according to Davis, "It was coming out at a high rate of speed." As soon as the ambulance came into Davis's line of sight, he snapped the photo. 1. 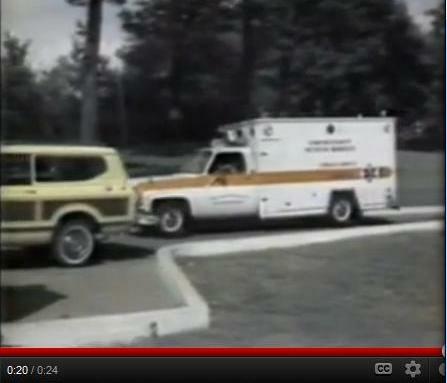 The ambulance is just beyond (east of) the yellow vehicle (which was often parked at the guard house during that time period). 2. There is no evidence that the ambulance is moving, though according to Davis, the vehicle was moving, and at a high rate of speed. 3. There is a small crowd of people on the north side of the driveway, facing towards the gate, and they are apparently watching the ambulance approach the gate. In this photo, two people can be seen on the left, and they would have been standing at that location only if other people were further to the left. 4. The girl in the yellow top would have been standing near the middle of the driveway width. There is no evidence the girl is in motion. 5. Davis would have been standing in the street, also in the middle of the driveway, just west of the small crowd. 1. If this photo was taken at 2:47pm, why was there a small crowd of people gathered around the gate? When the emergency call was placed at 2:30pm, there was no information provided to the public that Elvis was the subject of the call. 2. If the ambulance was moving at a high rate of speed, as stated by Davis, why is no one in the crowd moving out of its way? The ambulance would be turning right/north (to the left in this photo) literally within 1-2 seconds of the photo being taken, yet the people watching the ambulance are not getting out of the way. 3. If the ambulance was moving at a high rate of speed, why did Davis himself not move out of the way? A Polaroid instant camera would not have had a zoom lens in 1977, so the placement of the photographer can be estimated by looking at spatial relationships/comparisons in the photo. It appears that Davis was just west of the gate, and directly in the path of the oncoming ambulance. 4. A crowd could have gathered by the time the ambulance returned to the property with Dr. Nichopoulos around 4:00pm. The ambulance would not have exited the property at a high rate of speed at that time, which is what appears to be the case in this photo. Had the ambulance been moving at a high rate of speed, the two people on the left, as well as Davis himself, would have been getting out of the way of the speeding ambulance. Now, let's look at this captured image from a video taken later that day when the ambulance was departing the property after returning with Dr. Nichopoulos. This image is taken from WMCTV news footage. 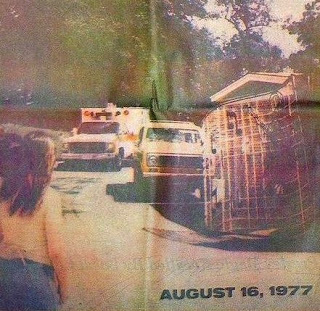 The location of the ambulance is very similar to the location of the ambulance as seen in the Davis photo, though the news footage shows that the ambulance was in motion. However, it was not moving at "a high rate of speed." The presence of the news camera indicates the video was taken later than 2:47pm (when the ambulance left with Elvis's body in the back, en route to BMH), probably just after 4:00pm. Given that the ambulance in this video is not moving at a high rate of speed, and the crowd of people in the Davis photo (including Davis himself) is not trying to get out of the way of an approaching ambulance that would have run over all of them when turning right towards BMH, it is very likely that Davis's ambulance photograph was taken at the same time as this video news footage, and not at 2:47pm. In fact, there is nothing in the Davis photo to indicate that the photo was taken earlier than 4:00pm.